Sometimes creativity is inspired out of a lack of choices, this is one of those cases. I had recently returned from a trip to God’s Pocket Resort, located North of Port Hardy, BC. Our fridge was nearly empty after returning, but I was keen to taste the bounty of the trip. This particular ling cod was caught on the way back from surfing a remote beach break on the West coast of Canada’s mainland. Catching the fish was a magnificent end to what was already an incredible and unique adventure. Mix all vinaigrette ingredients together, whisk to combine, and set aside for use. 1. Preheat large saute pan to medium heat, add 1 tbsp of oil and the shallots. 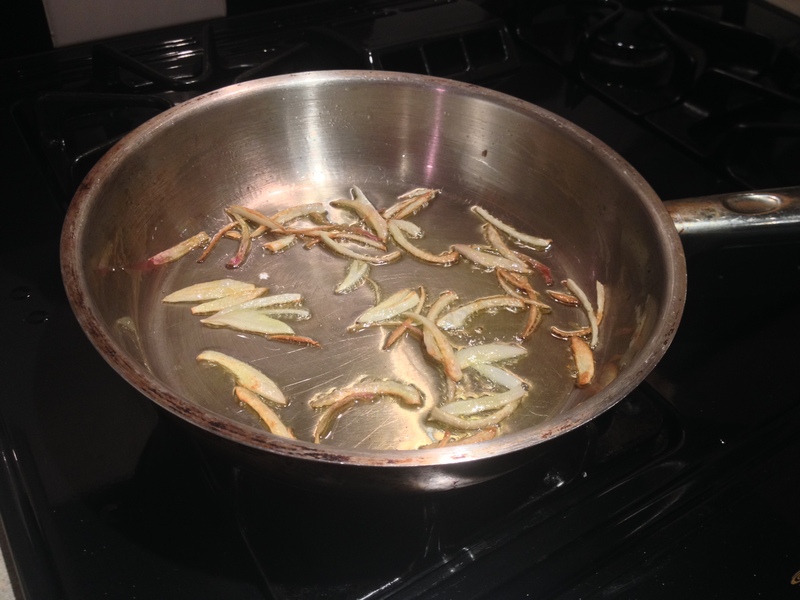 Saute shallots for about 15 to 20 minutes, or until a nice golden brown colour and crispy texture develops. If the shallots are browning too quickly, lower the heat. Keys are to keep the shallots spaced enough that oil surrounds each individual piece and to saute long enough to develop the crunchy texture. Set aside once cooked. 2. Heat the same pan to medium high, then add another small glug of olive oil. Season cod cheeks with salt and pepper, and saute for 5-6 minutes. These will cook quite quickly, so the challenge is to get some color without overcooking. Set aside once done. 3. Heat saute pan to high, then add pea shoots and toss for 30 seconds. Remove from heat and add Wasabi vinaigrette to pan and toss a few times. Transfer to plate, and top with cod cheeks and crispy shallots. Serve immediately. Thank you! I don’t cook with wasabi frequently, but I definitely want to more!